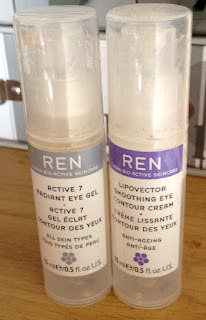 At the beginning of this year, I got the 2 products REN offers in the eye skincare department: the Active 7 radiant eye gel and the Lipovector smoothing eye contour cream. I was then suffering from dehydration lies around the eyes, and unfortunately Estee Lauder Advanced Night Repair had done nothing for me. (I had been using a mini jar received in a gift with purchase for a couple of months). I have been using the gel in the morning, as it is a very refreshing texture that sinks in very quickly and makes a perfect base for makeup. 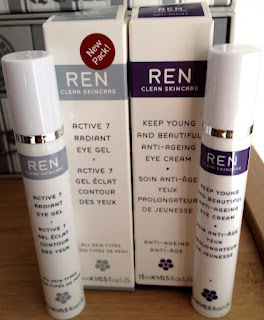 It is supposed to help with puffiness and dark circles, two issues that don't affect me too much but it really smoothes the area so that's perfect for me. The cream product is the one I use at night. It works on reducing the appearance of wrinkles, firms the area and moisturizes really well. It really really improved my skin condition around the eyes, and got rid of the dehydration lines I was suffering from. The packaging. Although it looks good and you can see how much product is remaining, the pump is awful and dispenses way too much, especially for the gel. 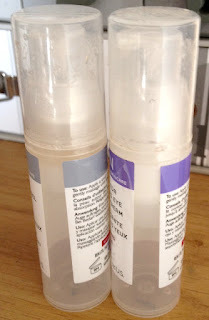 As you can see on the picture, even though I have used the cream more often (sometimes morning and night during winter), the gel has ran out faster because you cannot control the pump, but you get way too much at each use. This was so frustrating for me to waste so much that I had actually decided against repurchasing, even though I loved the products. So I e-mailed REN customer service about my issue, asking if that had been solved with the new packaging, and they confirmed that yes, the new pumps were much easier to control and I wouldn't waste product anymore. So I happily re-ordered! Indeed the new pump is different, you have more control on it and anyway, it dispenses way less product that the previous one. Now, since this isn't transparent anymore, you can't see how much is left, which is less practical, but I rather have a good pump than an transparent tube. So as you can see I'm gladly keeping on using these two (the cream has been renamed but it's the same product) and I would totally recommend them! I'm glad they changed the packaging! 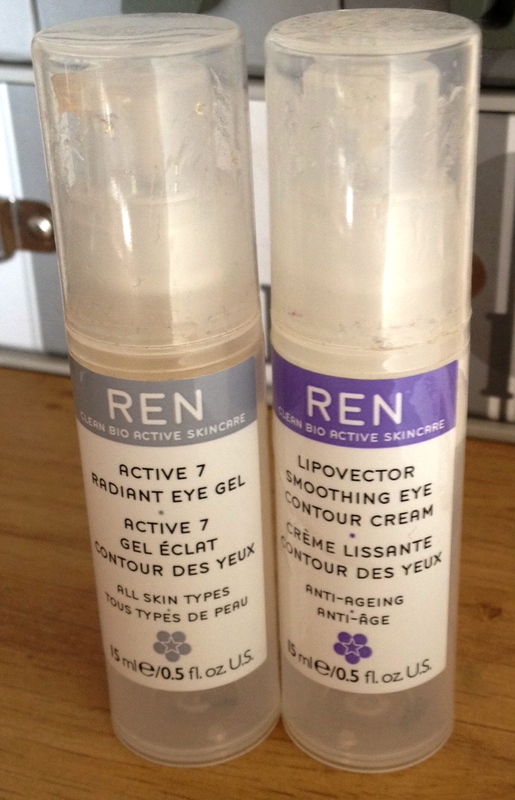 What a happy coincidence :) I have been using a REN night serum that I really like, so I'm getting more interested in their other products, as well. Sounds like a product sI am looking for, thanks for the tip. Thanks for sharing, I'm using a sample of EL Advanced Night Repair (which I got in Beauty Box) but I feel the same: it's doing nothing for me. I'll check if this one is available in my country.